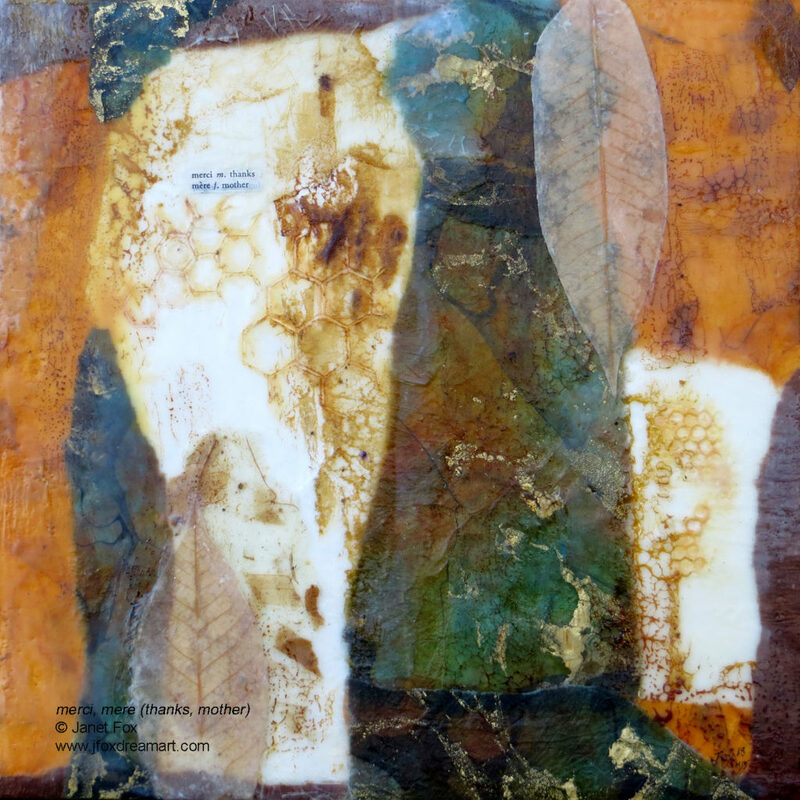 Merci Mère (Thanks Mother) is an original, encaustic mixed media painting. With aqua, gold and ivory paint and papers, as well as shellac burn technique, it includes these simple words from a French storybook dictionary. Creating something new, without a specific outcome in mind, can be a wonderfully relaxing process. In this painting, I began by collecting and gathering the various elements: art papers in my favorite colors, with some incorporating leaves. Next, I arranged and re-arranged these elements, until I found a design I found pleasing. Layering the papers added depth. Carved hexagon shapes, of various sizes, as well as a shellac burn and text, adds interest and intricacy. The finished artwork is 12 inches by 12 inches. Once upon a dreamscape, a woman was spending a quiet spring evening in a peaceful secluded park at the edge of a forest. Positioned up a bit on a hillside, she sees train tracks over yonder with a very unusual train. The train’s cars were open face, with flat beds and many cozy spaces. One of the cars, toward the back, is humming with a lot of motion. As she zooms her eyes and focuses in, she realizes the car is full of something living. It is full of all kinds of incredible talking ovaries!” They are fully alive and chattering amongst themselves, but only about what they know best…every and all kind of egg thing imaginable! Some were quiet and in serious conversations, while others were joking and laughing. This was a surprising and curious sight, indeed! The next car toward the front on the train is similar, except it is full of stomachs! They were busy talking about what they know best… all kinds of stomach things! And so it went like that all the way up to the front of the train, to where the brains were driving the engine. Now on the track in front of this women’s train, a big, dark and hollow train was barely moving, all tuckered out with only a tiny spark of energy. About now, “HER” voice from another realm is heard all around, filling every sound space. “SHE” directs the women’s train to approach the hollow train and to “drive through” it to fill it out from within. Once inside, the women’s train engine carefully makes its way through to the hollow train’s engine space, where it begins to settle down and fill it out. This dreamscape absolutely caught my attention; I was especially intrigued by the talking ovaries. The feminine voices must be heard: they were animated, energized, and speaking their truth in so many ways. This vivid dream was bound to inspire a painting, plus some interesting conversations and insight, too. “The Female Pelvis, Anatomy and Exercises,” by Blandine Calais-Germain, is filled with easy-to-understand text and illustrations showing the pelvic bones, how they are shaped, and how they move and work together. Separate chapters focus on the muscles, tendons, and organs. See how amazing this area is – able to dramatically expand and transform during pregnancy, childbirth, and then in later years. The book also shows targeted exercises to help keep this area healthy. While reading this book, I realized how much about this area I had not known before! Turning to the emotional, psychological, and spiritual realms, “The Creation of Health” by Dr. C. Norman Shealy and intuitive Caroline M. Myss explores the flow – and blockages – of energy, or chi, in this second sacral chakra region. And in the outer world, so many female voices are courageously speaking out, demanding to be heard and inspired by the #MeToo movement. This complete art piece includes 7 squares, each representing one of the chakra regions of a human being. 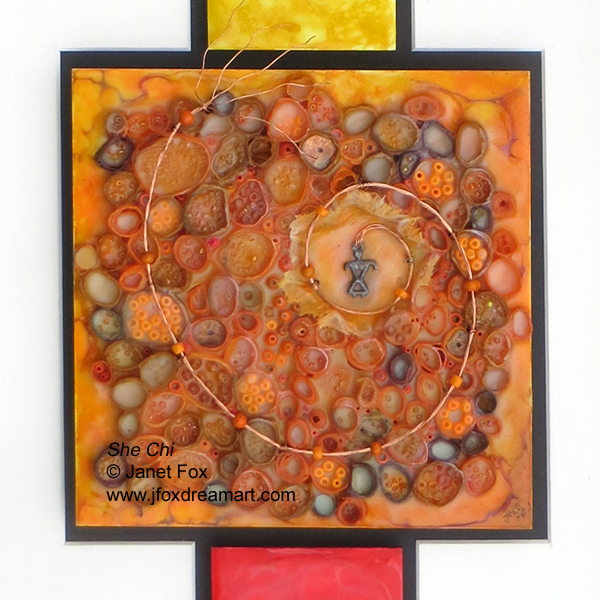 I emphasized the orange, second chakra area, with thin o-shaped coils of handwritten, egg and ovary-themed notepaper embedded in multiple layers of pigmented encaustic. A variety of round or egg-shaped beads fill many, but not all of the coils. 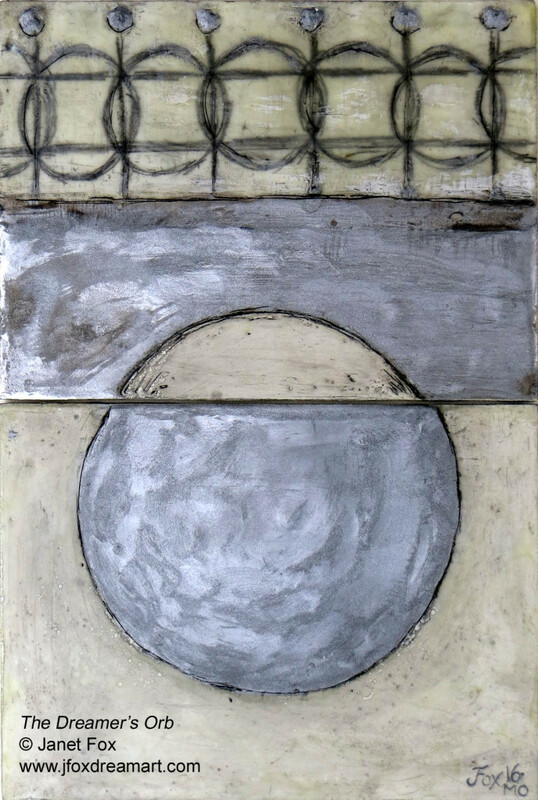 Finally, the feminine charm in the painting’s center, perhaps symbolizing a sort of kundalini experience, provides the energy to push forth its truth. The Little Girl’s Dream is an encaustic painting reflecting on the earliest dream I recall ever having. The image above is a sneak peek at part of it. 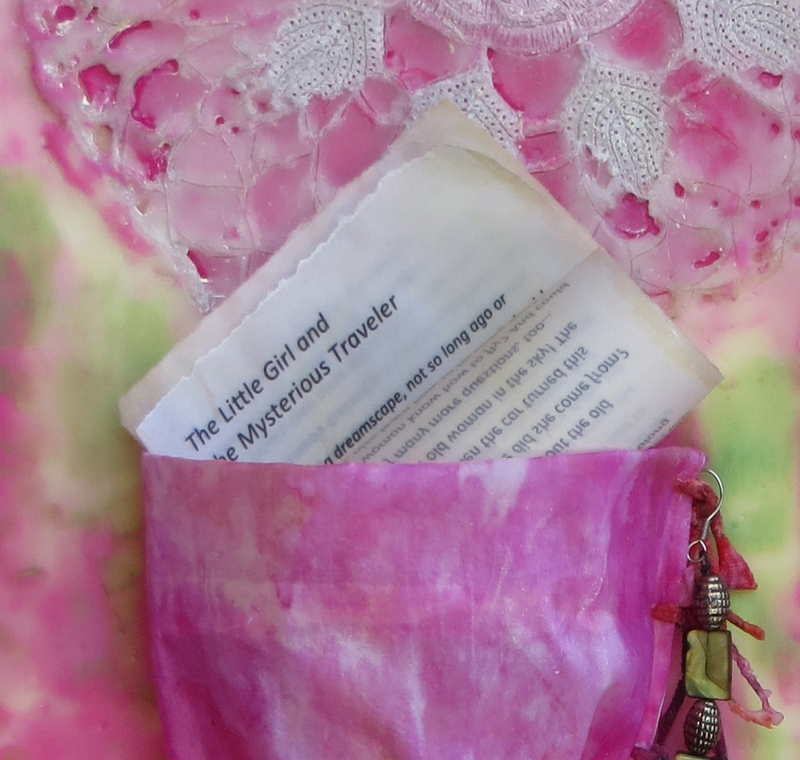 I’ll present about both at DREAM ART: Connecting to the Dream World through Art, Annilee Oppenheimer and Janet Fox, at the Jung Society of Washington on Friday evening, October 13th. Ms. Oppenheimer will begin introducing the topic of dreams and dream circles. I’ll follow with a recounting of my first dream and my process of creating this artwork. I’m looking forward to lively conversation. One thing I can reveal now is that while creating this painting, I came upon stories of Vasilisa and her trek to find Baba Yaga. Which also led me to this wonderful performance of Mussorgsky’s Pictures at an Exhibition, including Baba Yaga. This is so much fun already… dream on! Today, I’m thinking of the ageless wise woman. When I wake up in the morning, I often spend a few minutes lying still, listening to my body and thankful that I’m alive for another day. Most days have a schedule. But on days that don’t, I like to choose an intention and see if I can work on it throughout the day. Some days, I think of who I might see and what question I might ask of them. Who is this wise woman? She is the one who knows all things from a feminine perspective. I don’t think there is such a being within one person, but I try to look for core characteristics in the many people, female and male, who I will meet today. Business woman, author and broadcaster Lynne Franks’ presents wise women traits in this TEDxWhitehallWomen video. In it, she notes traits of responsibility, connection, laughter, creativity, leadership, teaching, nurturing, confidence-building, mentoring, integrity, courage, and bridge-building to generations of the future. I’m also reminded of the Hindu goddess Kali, who is a creator but also known for being a destroyer of what is no longer helpful, especially the dark forces. I’ve been fortunate to know many wise women. They show strength, vulnerability, compassion, humility, respect, love. They use their smarts, experience, and hearts to make the world a better place. Ms. Franks also notes in her presentation a quote by the Dali Lama at the Vancouver Peace Summit, in September 2009, that western women will rescue the world. Which energies do I need most today? Hmmm. Is it laughter, creativity, leadership, mentoring, courage, letting go of something… or something else I need today? When the opportunity is here, will I serve as a mentor to another? How will I make the world a better place for the generations of the future? What can I contribute? How does my purpose today fit into the purpose for my life? 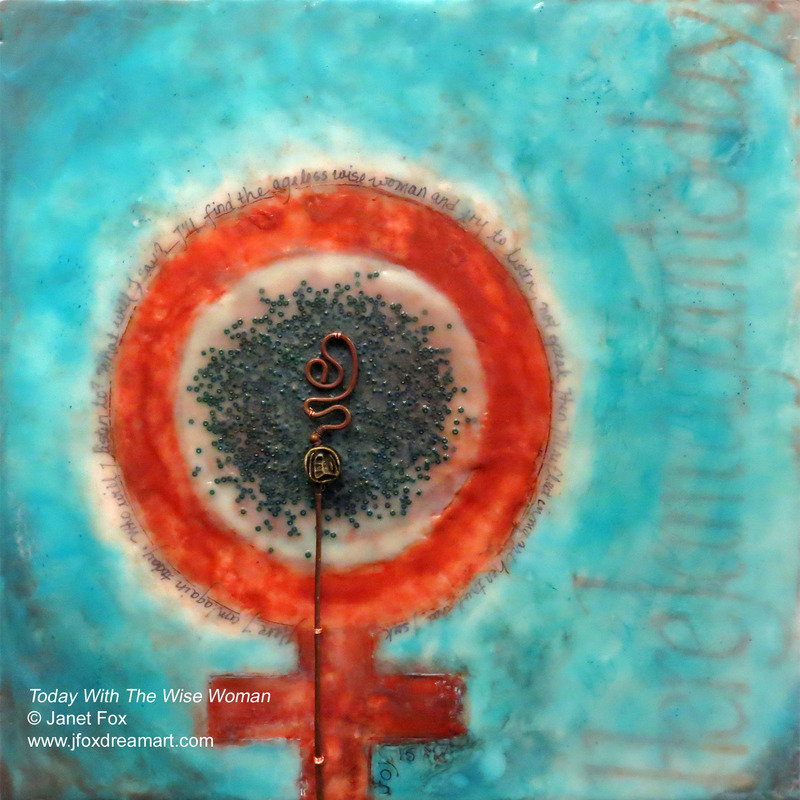 With May’s celebration of Mothers Day, I created this encaustic mixed-media painting in honor of the many wise women in the world. I used my favorite turquoise to surround the rust-colored feminine symbol, which also happens to be the sign and the color for the planet Venus. The tiny round glass beads fit nicely with the larger copper staff with the carved bead. 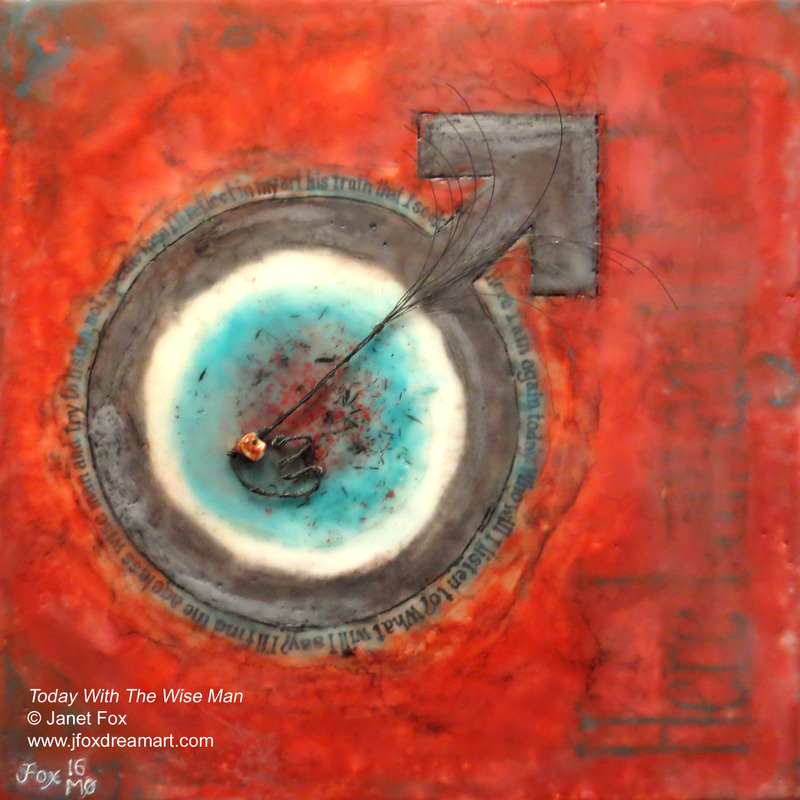 The short poem encircling the symbol leads to the bigger note: “Today With the Ageless Wise Woman.” It’s companion painting, Today With the Wise Man, is my next post.